The department announced suspicion to one of the leaders of the bandit formation “Crimean self-defense” and issued the state and international warrant. Prosecutor’s Office of the Autonomous Republic of Crimea suspected one of the leaders of the so-called Crimean self-defense forces under two articles of the Criminal Code of Ukraine: Part 4 of Art. 296 (hooliganism) and part 2 of Art. 146 (unlawful deprivation of liberty), the press service of the department reported on June 23. “It was found that in early March 2014 in Simferopol one of the so-called captains of the "Crimean self-defense" along with other members of this formation, motivated by hooliganism, physically injured a Ukrainian citizen, using a specially adapted and pre-prepared object. This Ukrainian citizen was in Crimea peninsula with the purpose of supporting Ukrainian military and pro-Ukrainian activists and currently he is a People's Deputy of Ukraine”, reads the statement. According to the Prosecutor's Office the suspect was involved in "illegal imprisonment, accompanied by torture and bodily harm, of a Ukrainian citizen who expressed his pro-Ukrainian position in the Autonomous Republic of Crimea." The Prosecutor's Office of the ARC did not call names of the suspect and injured individuals. Reference. One of the symbols of the occupation of the Crimea was people in camouflage with St. George ribbons, with batons and shields in their hands. On the eve of the "annexation" of the peninsula to Russia, they allegedly assumed the functions of law enforcement agencies, but in reality they were engaged in harassment and intimidation of Crimeans. 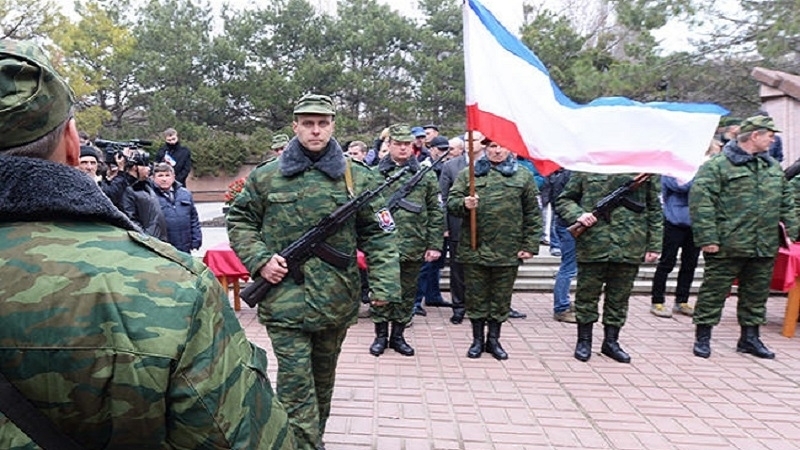 The so-called "self-defense" exists until now, but now it is called "Crimean people's militia." Members of the gangs receive a salary from the Crimean budget. Occupants beating Crimeans to be treated for "depression"